God's Love Ministries > Praise Reports > God has made my daughter a living testimony. God has made my daughter a living testimony. I am Ganesh. This is my wife Parimala Kumari and daughter Ashwini. We come from Vellore. My daughter is a medical student. In the year 2016 on the 5th of September she had a headache. One day she screamed in pain and was rushed to a hospital near my office. As soon as the check-up was done, she looked at me and said, “Daddy I will not be alive anymore”. And she fainted and fell down. She had no pulse. Her body became cold. Both my wife and I were weeping. I did the first-aid ‘CPR’. As soon as I did it, she began to breathe. We immediately rushed with her to a hospital in Vellore. When they took a scan, they said that she was in a critical situation and had to be kept in the ICU. After the reports had come, the doctor diagnosed her with AV MAL formation brain. We requested God’s Love Ministries to pray for her. On September 6th, we attended the meeting, ‘Anbarin Padathil Oru Naal’ . That morning, before the meeting commenced, we met brother and informed the condition of our daughter. That day, the words that the Lord said was, from the book of Joel 2:21 “Fear not. Be glad and rejoice, for the Lord has done marvelous things”. That night, we cut off her hair and a surgery was done. I went to the pharmacy to purchase some medicines and there I saw the same verse: Joel 2:21. As I returned from the pharmacy to give the medicines to the staff nurse, I turned back and saw the same verse in the hospital. I conveyed all this to my wife and kept praying. Later we brought our daughter home. And found that she could not walk, neither see, nor could she talk. 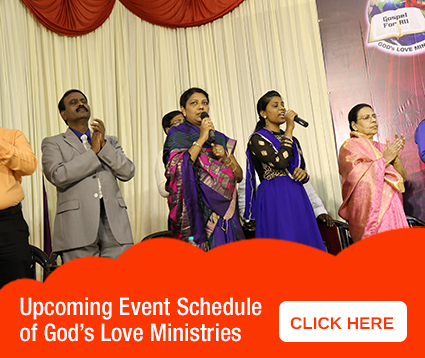 We kept praying and called out to God’s Love ministries. Brother himself called us and was about to pray for my daughter but she unexpectedly fainted and fell down. We cried aloud and shouted. We were asked to bring her to the God’s Love Ministries Prayer Tower in Kottivakkam where brother prayed for nearly eight days, both morning and evening. All the prayer warriors prayed for her too. Each day God healed her. 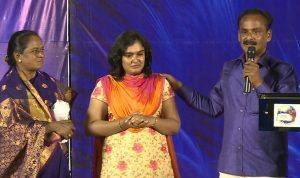 From the first day of prayer at the Prayer Tower, when Brother placed his hand on her head, she got healed completely. As brother kept his hand on her shoulder and prayed, the shaking of her head stopped. Each day God began to do new things. Today God has enabled my daughter to stand before you all as a living testimony. We thank God a thousand times. It is only by the grace of God that my daughter is standing to testify today. God has healed my daughter completely through brother’s earnest prayers. All glory to God. My dear brothers and sisters in Christ, you might also be suffering from problems like what Ashwini had. God is telling you that He is the greatest doctor. He will heal you according to the verse written in the bible: “By His stripes you are healed”.